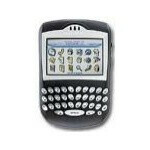 Cingular targets business travelers with the new Quad-Band RIM Blackberry 7290, operating on 850/900/1800/1900 MHz GSM wireless networks allowing for international roaming between in North America, Europe and Asia Pacific. The phone  is exclusive for Cingular in the US and is planned to hit the stores in early October. Promotional price will be $149.99 for new customers with two-year service agreement. This is also the first Bluetooth enabled java based device for RIM. The hand set comes with 32MB flash memory plus 4MB SRAM, featuring backlit full QWERTY keyboard, high resolution 240 x 160 color display with 65K colors including the traditional for Blackberry integrated attachment viewing (including support for popular file formats such as Word, Excel, PowerPoint, WordPerfect, PDF and ASCII) and remote address look up in addition to secure, push-based wireless connectivity, email and web browsing. This handheld will be released in Germany, Ireland, and the U.K. in November by the Eurpian company O2.